Hoffman’s Roofing and Siding 8u coach-pitch team won the regular season and tournament championships this year. It was Greg Hoffman’s fifth year of sponsoring the team. 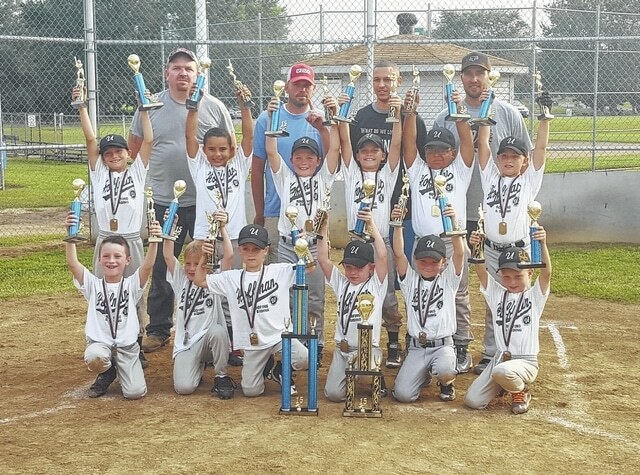 Hoffman’s Roofing and Siding won the 8u coach-pitch league and tournament championships this year during the youth ball season. It was a small consolation for the Hoffman family whose patriarch, Greg, was involved in a motorcycle-automobile accident around Memorial Day. According to Greg’s son Doug, one of the coaches of the team, Greg was stationary on his motorcycle when another vehicle hit him from behind. Greg was transported to a regional hospital and is now in therapy at Heartland of Springfield. His daughter, Debra Wilhelm, said recovery is slow, but she’s hopeful after visiting with her father. She said he opens his eyes, plays with a baseball and smiles when spoken to. Debra’s son Jackson played on the 8u team, along wth Doug’s sons Shane and Trent and brother Dan’s child Braydan. The boys decided they wanted to win a championship for their grandfather, so Doug and Dan set out coaching them to do just that. Greg now has the trophy sitting in his room, which Debra thinks makes him happy. In the meantime, Dan continues to operate the family business. https://www.urbanacitizen.com/wp-content/uploads/sites/36/2015/07/web1_Hoffman.jpgHoffman’s Roofing and Siding 8u coach-pitch team won the regular season and tournament championships this year. It was Greg Hoffman’s fifth year of sponsoring the team.